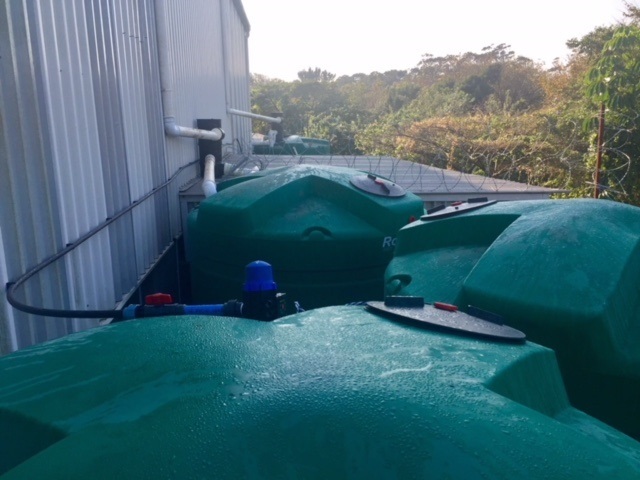 The rainwater water is recovered off a 5200sqm roof filtered via two WISYWF150 25 micron primary filters before transfer to four 10 000l rainwater storage tanks. From the storage tanks the water if filtered and purified using a 4 step water purification process before it is transferred to a 5000l intermediate water storage tank. The purification process filters out all items bigger than 1 micron and all potential bacteria is killed via a high intensity ultra violet light. With an average rainfall in excess of 1000mm per annum this factory can potentially harvest harvest more than 5 million liters of water per annum. All excess rainwater is used for washing and cleaning in the factory. According to the Factory manager this has reduced the overall factory water consumption by 70%.The rainwater has excellent properties and is very soft and is perfect for the use in personal products. The factory test the water on a weekly basis to ensure that it meets the required manufacturing standard.